Wow, this was just an amazing fun book. It is all about Rutabaga, a kid? Man? Boy? Well, at least he is brave, he loves to cook, and doesn’t shy away from helping anyone who is in need of helping (good quality). In this book we follow him on his adventures (though he isn’t that good at adventuring (given in how much trouble he tends to get), but he has to do it if he wants food for his cooking) and we see him cook all kinds of magical foods (because they are quite magical, that something so ugly as a monster’s corpse can look so edible in the end). Not all foods look magically yummy though, some foods are foods I would stay away from, very very far away. 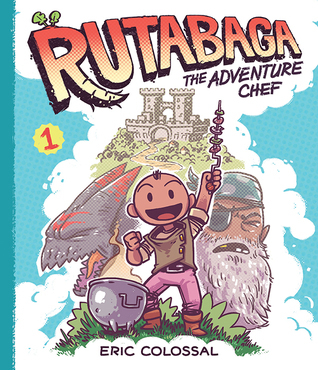 I laughed out loud at Rutabaga’s antics, and how he seemed to survive every time. He also has a best friend, Pot, and I just loved that it was added. It really added some charm to the story (not that it needed that, because it is already charming, but it added more). I loved the reactions of people when they found out that Pot was alive and could just walk around on him/herself. The art is lovely, I just love how everything is drawn, it is a really nice style and it makes you feel right at home, even when there are dragons to be fought. As soon as I finished this one I hurried to order the next one, and I am hoping it will be here soon. I would highly recommend this book to everyone. It is a fun, laugh out loud, sweet, charming story, and you will want to read more about Rutabaga (for instance, some more backstory would be nice).